All of Melbourne’s suburban railway stations have step-free access to the platforms. Except one: Heyington. To get to either platform involves steps. So, every Melbourne station except one has step-free access. That’s a long way ahead of many of the bigger old rail systems around the world. In Sydney, by my count, 109 out of 178 (61%) are accessible (following huge investment in lifts), though the proportion across New South Wales as a whole is around half. In London, it’s around a quarter of Underground stations and about half the Overground stations. It’s also pretty dire in Paris. It’s not that hard to see how this happened. 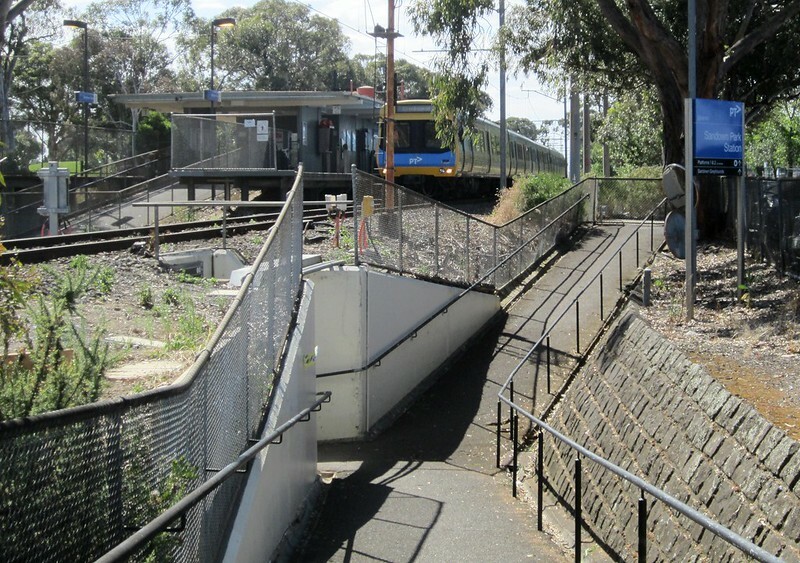 Much of Sydney is very hilly, so many stations hug the side of hills (like Heyington does), which would have made it quite difficult/expensive to provide ramps, back in the days when accessibility for wheelchairs or prams wasn’t seen as a concern. On old underground systems like London and Paris, some of the stations were built before lift/elevator technology had really matured, and it would have been expensive, and not seen as a priority. Providing ramps to station platforms deep underground would have cost a fortune, so to this day they’re very reliant on steps. Some cities are spending up big on retro-fitting lifts. How did Melbourne end up with ramps almost everywhere? There must have been a policy in place, because stations going back well over a hundred years have them — the MATHS stations rebuilt in the 1910s are a good example, but you can also find photos of Flinders Street Station from the 1890s with ramps. Whatever the reasons for the policy, it showed foresight. So, all Melbourne stations except Heyington are step-free. But this doesn’t make them compliant with the latest legislated standards. 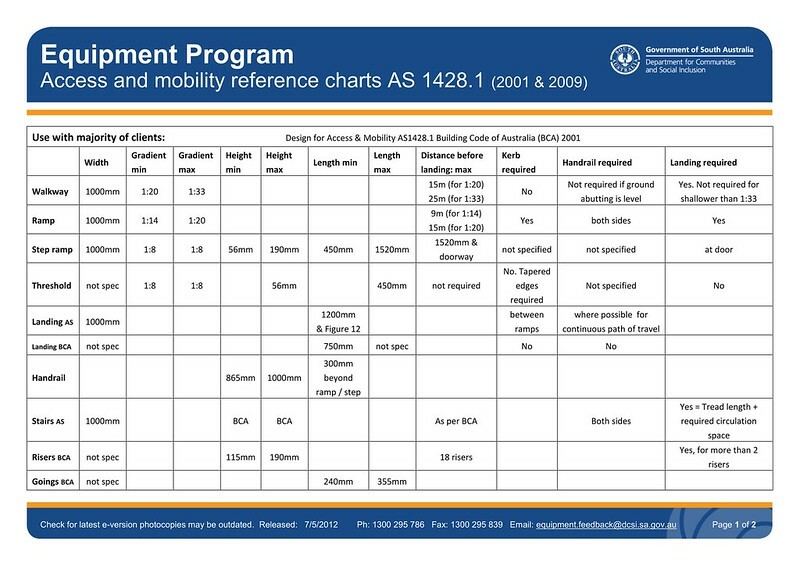 The Disability Discrimination Act, and the subsection, the Disability Standards for Accessible Public Transport are far more specific than just “no steps”. Melbourne’s station ramps, particularly the older ones, are too steep for some people in a hand-operated wheelchair to use, and can cause problems for people with other mobility difficulties. So basically you need ramps to be no steeper than 1:14, and at that gradient, you need a landing every 9 metres. DDA probably isn’t perfect. But it mandates a pretty good standard, which if followed, makes more public spaces accessible to most people, not just the able-bodied. The current state of many of the stations means, even though there are no steps, it’s difficult for some people to use them. In the past, some stations have been proposed for upgrades; some have happened, some have faced fierce resistance. Fortunately, the level crossing removal program is resulting in many stations being rebuilt to modern standards. This is a ramp down to the platforms at Bentleigh station — note the gentle gradient, and landing midway along. If you have specific mobility needs and you’re looking to travel — for instance, you might be capable of using modern DDA-compliant ramps, but not the older steeper ones — there’s not very much official information online. The rail network map simply says that only Heyington lacks step-free access. The detailed station information on the PTV web site doesn’t distinguish between a station with fully-DDA-compliant ramps and lifts, and one with steep ramps. Heyington has steps which means you can’t access the platforms any other way. 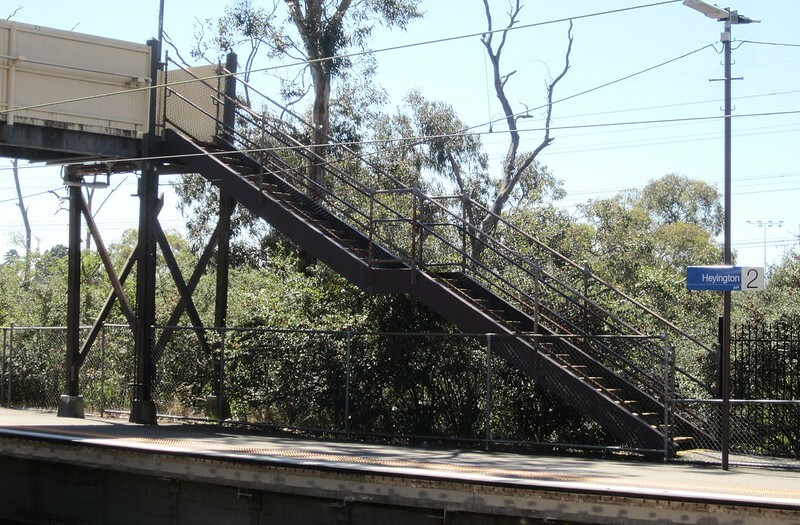 Box Hill and Ormond are also listed as having steps… but platforms are accessible via lifts and/or ramps. It mentions if station parking, phones and toilets are accessible, but again, doesn’t clarify what this means. Accessible from where? Caulfield’s new accessible toilets are on platforms 2/3, reached from the street via two steep ramps. Worse, it claims Heyington’s toilets and phone are accessible — I didn’t notice a telephone, and there are certainly no toilets available there. Google Transit doesn’t have any options other than being able to preference less walking, even though the GTFS data specification includes accessibility information. Ultimately if you need more information than is available online, the only thing I can suggest is contacting PTV and Metro for that information… if they have it. Perhaps we should be thankful that most of the train system is accessible, at least with assistance. Most buses are compliant. Trams… that’s another story altogether. Clearly a lot more is needed to improve the transport system as a whole to achieve full DDA-compliance. ATRF paper: An analysis of station infrastructure design to improve accessibility between the platform and suburban train carriages. Thanks to Karen for inspiring this blog post via discussion of her mother’s mobility needs. Next → Next post: Southland station, about to open – at last! Good write up. Thanks. Wasn’t aware. Even with lifts, it doesn’t make the station permanently DDA-compliant. I have on prior occasions notice the lifts at Laverton either being serviced or faulty, and observed a couple of elderly passengers having to slowly and carefully walk down the stairs to exit the station. When I raised it up with Metro, they informed that they have made announcements through the Metro app. All good for me, but I think a portion of society who doesn’t use the mobile and require accessibility access would be impacted by this. But thats amongst the generally pedestrian unfriendly Richmond station which keeps the majority of its access closed. My take on the old ramps is it was all about passenger throughput. Between the 1880s and the 1920s Melbourne’s rail system was one of the most heavily patronised in the world, and plans put great emphasis on platform capacity – even more so than track capacity. In the absence of reliable escalators, ramps came up as the best option. I’ve seen similar in regional UK stations from the same era. Unfortunately, we now know such ramps are not only unsuitable for wheelchairs but downright dangerous – and regrettably, ramps designed to be safe and convenient for all abilities, combined with contemporary height clearance standards, do mean a very long walk for the unassisted. Maintaining access for the required passenger volumes is therefore now utterly dependent on escalators that don’t break down, together with both lifts and ramps to provide access for all. Thanks for an excellent, comprehensive post, Daniel. If anyone’s reading Daniel’s post and thinking “Well, lack of disability compliance is unfortunate for the people affected, but it’s not my problem, because I’m not disabled and I don’t know anyone who is…”, may I remind you that if you live long enough, it WILL be your problem. Each one of us is only one accident or serious illness away from being disabled, perhaps permanently. And even if you’re lucky enough to avoid accidents and illnesses and still be fit and active and running mini-marathons in your fifties and beyond, age WILL eventually catch up with you. It’s only a question of how soon and how severely. I’ve never enjoyed running, but I’ve been a walker and public transport user all my life, and age has caught up with me. My knees are shot, and although I can still board a high-floor tram most days (with difficulty and a few grunts of pain), the day is not far off when I won’t be able to manage it at all. Even now, if I think a low-floor tram is not too far behind, and I’m not in a hurry, I’ll wait for that one. I had completely forgotten that the only access to Essendon Station is via ramps. And they are too steep for her. This is a station she had used dozens of times when she was younger. It’s now completely off limits to her. She had already come to terms with that, but it came as a real shock to me. I am hoping that the level crossing removal project at Essendon will involve a redesign of the station that will restore to her the access she has lost. The thing I cannot accept is that there’s often no alternative. It’s hard enough to be smacked in the face with the painful fact that you can no longer do what you used to be able to do so easily, and will need to look for an alternative, such as an escalator or lift. But what about when there’s NO alternative? When the station, or building, or vehicle, or whatever, is totally off limits, because there are only steps or a too-steep ramp? And that means your journey is either out of the question, or you’ll have to go miles out of your way to get there? I will never accept that. I will keep fighting for disability access, to make people aware that our built environment still has a long way to go before it’s completely accessible. I urge every one of you who has read Daniel’s blog post to make it your fight too, because even if you don’t need that access now, some day it will become your problem too. The often seems to be very poor analysis of value-for-money for competing alternatives for the limited dollar. An example is Redfern, Sydney’s equivalent of Richmond, where there are no ramps and no lifts, while huge structures are built at obscure places like Lochinvar. A place like Heyington, for example, do disabled people who don’t live there make random trips to there ? Not many, I suspect. And the people who do live there will quickly figure out if they can manage the ramp that exists, or not, or need to go somewhere else. I am not sure if there is any practical means of disseminating the news that a lift is not working for some reason. If you can’t manage the bus, there is always the option of a taxi suitable for disabled people. There isn’t always the option of a taxi. There’s only the option if you can afford it. Many disabled people are on very low incomes, and taxi fares are often way beyond their budget. No disabled person should be shut out of the public spaces and facilities that able-bodied people access and take for granted solely because they can’t afford the only alternative available to them. That is simply inequitable. This problem is not helped by the fact that Metro and VLine staff are not allowed to help push wheelchairs of any kind, even light weight non electric wheelchairs, due to their OH&S rules. When I asked Metro about this their response was “Where a wheelchair customer requires assistance, it is the responsibility of a carer travelling to assist” . Too bad if the only assistance that you require in a day is to be pushed up one non-compliant ramp. Also at some stations the portable ramp that the driver puts between the train and the platform is non-compliant due to the height of the platform relative to the train. Essendon is worst station I have seen this but there are many other examples such as Richmond. Interesting thing about Heyington is that whilst access to the platforms is only available via steps, on the citybound platform a ramp was built to replace the former step access to the sheltered waiting room. This ramp can be seen in the second photograph in Daniel’s post. I guess if a wheelchair bound passenger made the unfortunate mistake of getting off at Heyington, at least they would have access to a sheltered waiting room to wait for the next train. This is a good time to remember that Heyington is also the station where a teenager died after falling between the train and the platform in 2014. With that and the lack of accessibility you’d think there’d be a plan to rebuild it by now. I’m guessing St Kevin’s would probably be against that however as they appear to be the main users of the station. Another point to consider is the placement of Infrastructure. Just because a station is DDA compliant doesn’t mean it’s easy to use. An elderly woman with severe vision impairment told me she can’t find the lifts at Laverton station. They are tucked under the stairs. IIt wasn’t a problem until the timetable changed on the Altona loop and she was forced to change trains to go to Werribee. Come to think of it, everything about Laverton station is very ordinary. Extremely steep steps seemingly to the Everest base camp, coupled with lifts and no ramps make this an excellent example of what not to do. Every station is accessible except Heyington, not too bad for the suburban rail network. Box Hill has also been a source of annoyances for mobility-impared people when the one and only lift has broken down. On the other hand, Melbourne’s tram network is a complete shambles when it comes to accessibility. If you are not on route 96, the Port Melbourne end of the 109, or in the Hoddle Grid, St. Kilda Rd or Victoria St precincts, you are stuffed regardless of what type of tram is running. The trams might be low floor, but without accessible stops they are completely useless. This is the case with just about every D class tram on the former M>Tram routes. Don’t be fooled by those Citadis trams running to and from Box Hill either, if you are get on at Box Hill and are not getting off at sleepy old Mont Albert, the next accessible stop is at Victoria Gardens Shopping Centre. They didn’t even think of putting in accessible stops at major interchanges along the way such as routes 72 (Burke Rd), 16 (Glenferrie Rd) and 48 (Kew Junction), all of which have low floor trams (route 78 only has high floor trams). Kew Depot doesn’t have an accessible stop either. The outer ends of routes 16 and 72 don’t have any platform stops whatsoever unless one goes out of their way to count the one and only stop at Gardiner station on the 72, which itself only exists due to the grade separation work. The PTV website’s accessibility page is also outdated and missing platform stops including the aforementioned Gardiner stop. Yarra Trams’ own accessibility page on the other hand proudly displays a B class tram at one of their accessible stops! The PTV website also lists accessible tram stops on routes which are run exclusively with high floor A and B class trams, such as the 70 and 75, what is the point of telling a disabled passenger out at Vermont South or Wattle Park to wait at certain DDA compliant platform stops if they will never be able to catch a tram? Also, speaking of the 75, why the hell is the Vermont South terminus, as huge as it is (it can hold several buses and at least four B class trams), completely void of facilities such as myki top-up machines and even toilets? In fact, there is not a single myki machine at a route 75 tram stop all the way from Vermont South to Jolimont station unless you go hunting for them inside shops!!! Fat lot of good the newsagents and chemists are by the way, when the trams are running up to seven hours after the shops have closed in some cases, and some of these shops aren’t even open on weekends or public holidays. Only the government could think of hiding myki top-up facilities inside shops that are only open 9AM to 5PM, as opposed to the 24-hour Coles Express right next to the Vermont South terminus. Of course though, the Victorian Government wouldn’t want someone topping up a myki at a petrol station when they could instead be buying fuel and driving everywhere!!! No, every station is STEP-FREE except Heyington. Step-free and accessible are NOT the same thing at all. The whole point of Daniel’s post was about exploding that myth. It’s even in the title. Every station with a steep ramp is inaccessible to people like my mother, as I explained above, and to people who use wheelchairs or mobility scooters unassisted, as @meltdblog and @Chris Lowe explained. And there are a LOT of stations with steep ramps. Essendon, Glenferrie, Victoria Park, the MATHS stations… and they’re only the stations I’ve used recently and remember well. I’d love to do an assessment of every single station in Melbourne and work out whether it’s accessible for someone like my mother. I bet a lot of stations would be ruled out. And we haven’t even begun to consider people with impaired vision who struggle to locate the tucked-away lift, as @Jen explained. I agree with you that the trams are even worse. DDA compliance in the tram system is an absolute farce. As @Daniel wrote: “Trams… that’s another story altogether.” It would take another whole blog post to do justice to the lack of DDA compliance in the tram system. I do understand that your comment was meant to highlight just how awful trams are in terms of accessibility. You are absolutely right. But please don’t dismiss the inaccessibility of many railway stations just because the trams are even worse. Because of the previous steep ramp policy, it is disproportionately the stations with access via a pedestrian level crossing (usually at a road level crossing) that have access without a steep ramp. Caulfield also has an accessible loo on platform 4, where the ramp is divided by access to the street. Caulfield and South Yarra need additional concourses, which would be DDA compliant. Glenferrie and Camberwell (and maybe some other as well) could also benefit from additional concourses. On the Lilydale Line, which I am most familiar with every station between Lilydale and Box Hill is probably compliant. Except for Ringwood East which I think might have some problems although is still better than many. Also, The ramp the driver puts between the train and platform may not be compliant at Lilydale and Ringwood East because of the height of the platform. Box Hill is not only a problem when the lift has broken down. Platform four has no lift access and is only accessible by a non-compliant ramp. I have never used Chatham, East Camberwell or East Richmond so I can’t comment on those stations but the other nine stations between Box Hill and the city are all non-compliant. At least disabled people can still use a train at a platform that has a steep ramp, it’s just that it’s a pain in the asre for those tackling the hill on their own. People moaned about Ringwood’s ramps for over seventy years until the ramps were finally replaced, and now they moan about how long and winding the new DDA-compliant ramp is, or the fact that the one and only lift is five carriages away from the front of the train! If you want to relive the experience, Belgrave station is basically identical to the original Ringwood ramps complete with the footbridge, with the added bonus of a pipe frame obstacle course at the bottom. On the flip side, try boarding a low floor tram in Cotham Rd or Glenferrie Rd. Accessibility at its finest! Actually the key point here is that some disabled people can’t use them. Oakleigh and Huntingdale are also to be upgraded to DDA compliance. 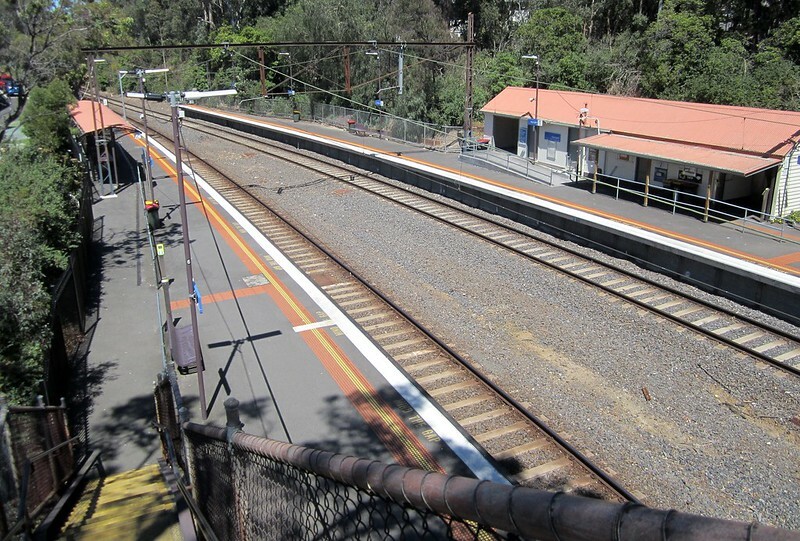 Oakleigh, like Essendon, has 3 platforms, a side platform and an island platform, where only the side platform is accessible at ground level and the island platform is accessible only be ramp. However the side platform is actually used at Oakleigh, during busier times when platform 2 is not (although using it full time would increase DDA compliance and thus allow some people unable to use the steep ramps to use the station, although they would need to change trains either side of Oakleigh for a one station wrong way trip to one one leg of their journey, until Oakleigh is upgraded). Using the side platform at Essendon is much harder because it is too short (Essendon`s side platform must have escaped the late-1960s/early-1970s platform extension program because of the pedestrian subways at either end of platform 1 and the end of Essendon as a significant terminus for peak-hour trains) but that is to be rectified by the level crossing removal at Buckley St (the LXRA do not say how, just that it will be rectified). That reminds me. Is anyone able to point to any specific plans online of the Essendon Station redesign? I don’t mean the Buckley St tunnel, or the details of how Buckley St / Rose St / Russell St traffic will be rerouted. There is plenty of detail online about that, including a video. I’m talking about the actual station buildings and how passengers will access them – whether they’ll have lifts, escalators, DDA compliant ramps, or whatever. I’m also wondering how pedestrians will cross from Russell St to Rose St. Currently there are three pedestrian subways: the southernmost one, which has stairs; the middle one which has steep ramps and leads to the station entrance; and the northernmost one, which is the only one that’s completely level, and the only one that people such as my mother can use when they need to cross from Russell St to Rose St.
It’s unclear whether and how these subways will be replaced. Have the detailed station redesign plans been made public yet, does anyone know? I went looking for them again a couple of weeks ago, and found nothing. Just the traffic flow and Buckley St tunnel details. This is a new DDA compliant underpass on the south side, that only crosses the tracks, with no access to platforms. It appears to show the 3 other underpasses will be left as-is. It also doesn’t show any extension to platform 1. This seems like a shocking oversight. Maybe later they’ll announce after ‘consultation’ that ‘ in response to feedback’ they have decided to build additional ramps in the space b/w tracks 2 and 3 to connect the new underpass to the platforms. Thanks for your comments, @Bramley. It appears then that the LXRA don’t yet have any plans more detailed than what I’ve already seen. You’re right; it looks like a shocking oversight. The proposed DDA-compliant “shared user underpass on the southern side of Buckley St” is necessary but not sufficient. Necessary, because there does need to be something to replace the existing pedestrian level crossing on the south side, so that (e.g.) someone coming from Carlyle St can get to Sherbourne St or St Columba’s or Lowther Hall without having to walk over the top of the new Buckley St tunnel, use one of the existing subways (the closest if they’re able-bodied, the furthest if they’re not), and walk back again. But not sufficient, because almost all of the pedestrian/passenger activity is north of Buckley St: the buses, the station, the tram, and the vast majority of the shops. They appear to be keeping the existing northernmost subway – the one that is currently dead level, and therefore currently accessible. But I’m troubled by the lack of a disability symbol next to it. Why is that, I wonder? Is it because that subway is old and narrow and poky and in some way not quite DDA-compliant at the moment? Or does it mean they’re planning to do something to it to make it inaccessible? And the worst part of all is the lack of any disability symbol next to the station building, or any information at all about how the station and the subway leading to it will be made DDA-compliant. This suggests they have no plans to do anything there, and it means the subway will continue to be off-limits to a substantial number of disabled people. That’s really not acceptable, given that Essendon Station is not located in some far-flung suburb and used by relatively few people. It’s a significant public transport interchange point, serviced by a train, a tram, and about 8-10 bus services. Even if the LXRA do as an afterthought what you suggest, and build DDA-compliant ramps from the new underpass to the platforms, that won’t help a disabled person getting off a bus in Rose St or Russell St and wanting to change to a train, or vice versa. For a disabled person, it’s quite a distance from the bus stops to the south side of Buckley St and back again. A motorised scooter or wheelchair helps, but for a person with a manual wheelchair, a walking stick, or a walking frame, that’s a lot of effort. My mother could do it, but at the speed she walks, I estimate it would take her about 10 minutes to cover the distance. That’s very frustrating when the station building you need to access is literally right beside you as you step off the bus and your train is due in 5 minutes. They’re pouring a massive amount of money into this level crossing removal, but are paying only lip service to the needs of the disabled, especially disabled train passengers. The needs of the motorist appear to have monopolised their attention. Not good enough. I see there’s a link where they’re still asking for feedback even at this late stage, so I think I will give them some. My memory has failed me. I’ve just used Google Street View to double-check the northernmost subway at Essendon, and it’s NOT dead level, as I thought. It’s level on the Rose St side, but there’s a ramp on the Russell St side. It’s hard to tell from Google how steep the ramp is, but I’m guessing steeper than DDA compliance permits. That would explain the lack of a disability symbol on even that subway. So in summary, it would seem that NONE of the three existing subways at Essendon is DDA compliant, and (unless I hear otherwise from LXRA when I ask them, which I plan to do) there are no plans to make them so, despite this huge and expensive project which is about to commence. I think you are correct. While I am not very familiar with the area I used the station twice last year and I don’t think any of the subways are compliant. As I said above another problem at Essendon is the platforms at Essendon are also very low relative to the train, especially on Siemens Trains. I have seen a wheelchair start to tip while getting off a train at Essendon because of the gradient. It was only saved from tipping by the driver. As such I think the whole station needs to be rebuilt but I am worried it may not get done as part of LXRA’s work and then it will be years before it is made compliant. When I first went to the station last year I was actually trying to go to Broadmeadows but I had to get off at Essendon because of rail replacement. So I had to get off there and deal with the access issues whether I liked it or not. You make some excellent points, @Chris. I hadn’t thought about bustitution. 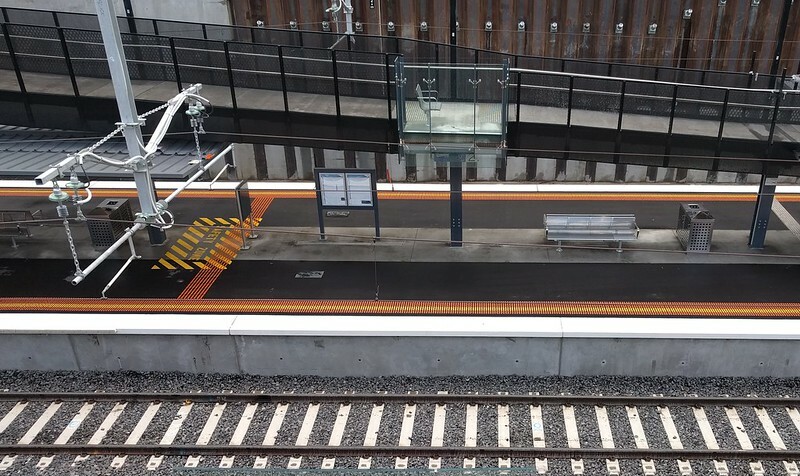 Even if a disabled person normally avoids Essendon because of its steep ramps, low platforms, or both, they may find themselves unwillingly turfed out there because of track work or a train breakdown. My comment hasn’t appeared on the page yet, and I’m guessing it won’t until they answer it. A commenter here made points made about disabled people that crossed the line. Their comment has been removed. The comment rules on this site are not new. Debate is welcome, but if you come here just to cause trouble, or even if you do so through accidental insensitivity, don’t expect to have your comment published. @Karen, @Bramley, @Chris. One of the reasons, perhaps THE reason, for the new pedestrian subway south of Buckley St is for cyclist access across the tracks. As mentioned in this thread, it is away from where most pedestrian traffic would be, but is still beneficial to many pedestrians. Two birds, one stone: cyclists and PWD, new subway, though there is still the access problem to the station proper. As for changing the station, whether the buildings or platforms or access, many of the people protesting about the LXRA proposal appear totally against that idea. I suspect they are holding out against it hoping to achieve their preference for a long tunnel including Moonee Ponds Station and other crossings. I agree that the Essendon platforms are atrocious for accessibility, and I would prefer the platforms at least be straightened. I think you’re right, @Kevin. That’s the strong impression I get from reading some of the comments on the LXRA page. And I’m not entirely out of sympathy with them. I don’t normally give away too much identifying information about myself, because I like my privacy, but suffice to say that I know the area around Essendon Station very well. I lived and worked in the area for more than 15 years. We had a family business there, and a few members of my extended family still live there. I must have walked along that stretch of Buckley St literally thousands of times. So although I’ve now lived all across Melbourne, the Essendon area is still very much “home”, so to speak, and I go back there often to visit. And when I watch that video showing the proposed Buckley St tunnel, and I can even catch a glimpse of the house I once lived in and the building where my family ran their business… look, I can see the need to remove the level crossing; I can accept all the reasons for making it road under rail; my head says it’s a logical, sensible decision – but I also feel like “my” street will be ripped apart and have a massive concrete canyon plonked in the middle. MY street. It’s a visceral reaction. And if I can feel like this – me, someone who doesn’t even live there any more! – how much harder must it be for the people who really DO still live and work there to accept. I’m only an occasional visitor. They’ll be there every day. It’s painful for them. That doesn’t necessarily mean it’s the wrong decision, but it’s painful. So I’m not going to judge too harshly the people who are raising objections in the hope the road-under-rail plans will be abandoned and they’ll get the rail tunnel they want. I don’t think they’ll succeed, but I can’t judge them for it. By the way, it was never my intention to dominate this page with discussion of this station to the exclusion of all others, or to turn it into a LXRA debate. Essendon is only one of many stations that have significant accessibility problems, but it’s topical because the LXRA project is due to start there soon. If anyone wants to expand further on the accessibility problems that other stations have, or the other issues that Daniel raised in his post, such as the PTV website and Journey Planner, please do. LXRA have replied to my question about whether there are any DDA-compliance alterations planned for Essendon as part of the level crossing removal. Alterations to the existing station structure and existing underpasses are NOT within the scope of the project (just as we suspected). The project only covers removal of the vehicle and pedestrian level crossings. They’re aware of the disability access problems, and that issue, along with how best to reroute bus 903, is still under discussion. Since I sent that question, I had an idea about rerouting the 903 which makes it a tiny bit slower (I estimate 3-5 minutes), but has the huge advantage of keeping its bus stop on the same side of the railway line as it is now. See the tweets starting here for details: https://twitter.com/kcIMT122/status/930228541358088192 Keeping it on this side means disabled passengers retain all the Russell St bus connections they have now (many more than Rose St), and if they really need the buses on the Rose St side, or the Rose St shops, they can continue to do what they’re no doubt already doing: stay on the bus until it gets to the first stop beyond the railway line, and exit there. It’s still not ideal. The only way of fixing the problem for good is to rebuild the station underpasses to make them DDA compliant. But that’s not going to happen any time soon, and keeping the 903 in Russell St at least means no disabled person will be worse off than they are now, which is very important. Rerouting the bus along Rose St means many would be significantly worse off, because it’s a long way back to Russell St when you’re disabled. I’ve forwarded that suggestion to LXRA and will post here again if they reply. Comments from readers of this blog are welcome, either here or on Twitter. Is there a time limit for when transport infrastructure needs to be made DDA compliant? It will obviously be a serious undertaking to make all 200+ train stations, and however many tram stops DDA compliant, and will create some interesting design issues in some cases – but must be done! After all the RRL, level crossing and electrification works, presumably just about all the stations on the Sunbury line are now DDA compliant – except Middle Footscray (ramp too steep, I would think – as probably is the footpath on the Victoria Street underpass to get to the entrance ramp) and maybe Tottenham and Albion. I know scope-creep of projects is an issue, but some forward thinking would be good – as the discussion on Essendon shows. When was the last time a train station was made DDA compliant on its own, not as a byproduct of other works? Maybe the first go at replacing the overpass at Footscray before RRL.